Louise, Mike, and Andy decide to attend the Heritage Foundation’s annual Resource Bank meeting at the Renaissance hotel in Chicago, April 29-30, 2004. 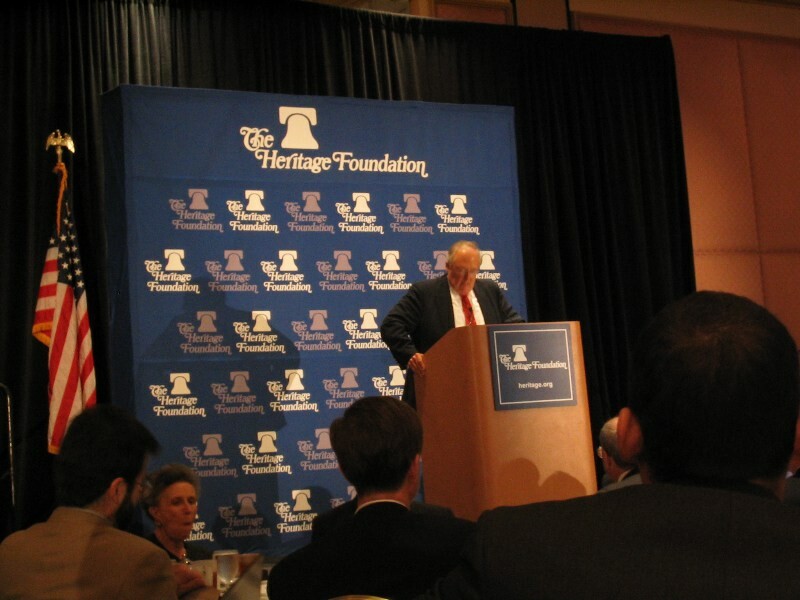 Heritage is the biggest free-market think tank—in fact the biggest think tank period—in Washington. It has a budget of $80 million and provides "talking points" to conservative Congressmen who don't have time to do their own research. 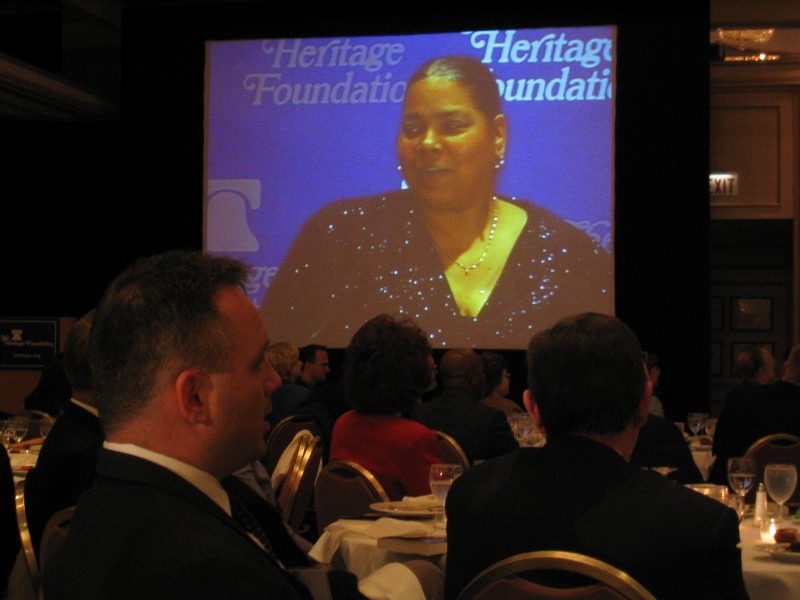 Heritage is a kind of "grey eminence" behind Congress, and very actively helps direct U.S. politics. And what a bunch of radicals these folks are! Like the rare ultra-anarchist, they basically want to "smash the state"—but unlike such anarchists, they're rich, not so rare, and succeeding. 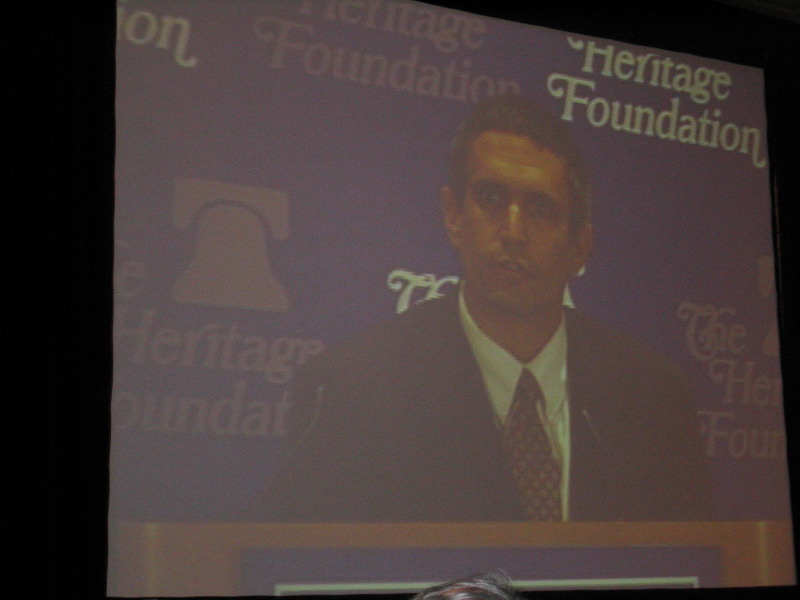 In order to register (free) for the Heritage conference, we've formed a right-wing think tank ($12 for the domain name). 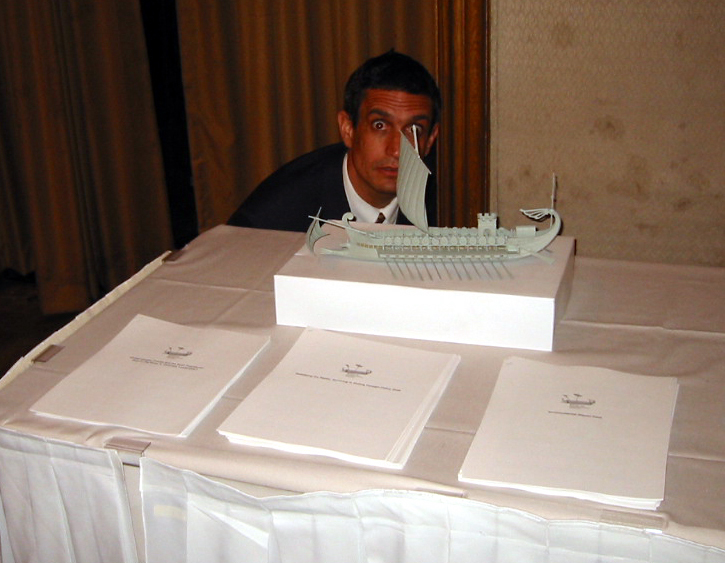 We've also registered for (free) table space, so when we arrive at the hotel we immediately go looking for an open table to display our wares: a foot-long Roman warship ($30) and some insane but fully fact-based "position papers." (Yes, the Bush Administration really has contemplated wafting oceans of hydrofluorocarbons into the atmosphere to help along global warming: download the full report at ems.org and search on "hydrofluorocarbons.") We eventually find an empty spot, next to the Cato Institute and not far from a table featuring books like Eco-Imperialism: Green Power, Black Deathand How Union Bosses Have Hijacked Our Government. The event teems with 650 smiling, friendly and blandly-dressed people hired by well-endowed think tanks fighting "socialistic" ideas: the Jesse Helms Institute, the Hoover Institution, the Atlas Foundation (based on the books of Ayn Rand), the Society for the Economic Study of Religion (which, a young representative tells us, has determined that Pentecostalism is the best religion for a free market, and so sends missionaries to Africa), and so on. We dive deeper and deeper into the remarkable logic of conservative thought. For lunch, as brown-skinned people serve us chicken, millionaire money-manager Derwood Chase tells us about his personal efforts to help keep taxes down and end the government handouts that make people fat and lazy. Throughout the rest of the day, we attend foray after stultifying foray into the importance of bringing U.S. "socialism" (public education, public health care, Social Security) to an end. There's even a foreigner: a Chilean economist who describes the wonders of Chile's development since Pinochet. After lunch, some young protesters wearing ostrich suits demand that lawmakers get their heads out of the sand and fix Social Security. When asked about their concept, the ostriches shrug and send us to a spokesperson for the lobby group "For Our Grandchildren," who reluctantly explains that the protesters are temps, hired that morning. "For Our Grandchildren," it turns out, wants to "reform" social security by letting people choose to invest wherever they want to. Perhaps their most visionary claim: Social Security is unfair to African Americans because "African Americans have lower life expectancies than other Americans. This means that in Social Security’s live-long-or-lose-out program, most African Americans lose out." That’s right: since African Americans have shorter life expectancies, we should get rid of the program that would help them in the unlikely event they make it to retirement age. 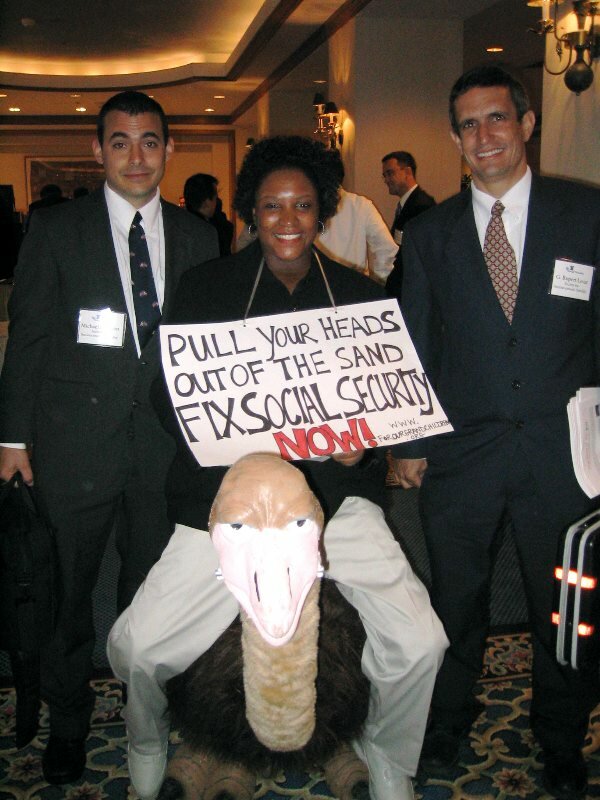 We go over to the young African American woman in the ostrich suit and ask if she knows she's protesting against social security. "Against it?" she says, confused. "No, we want to fix it!" Not wanting to make a scene so early in this two-day affair, we put our heads in the sand and move on. 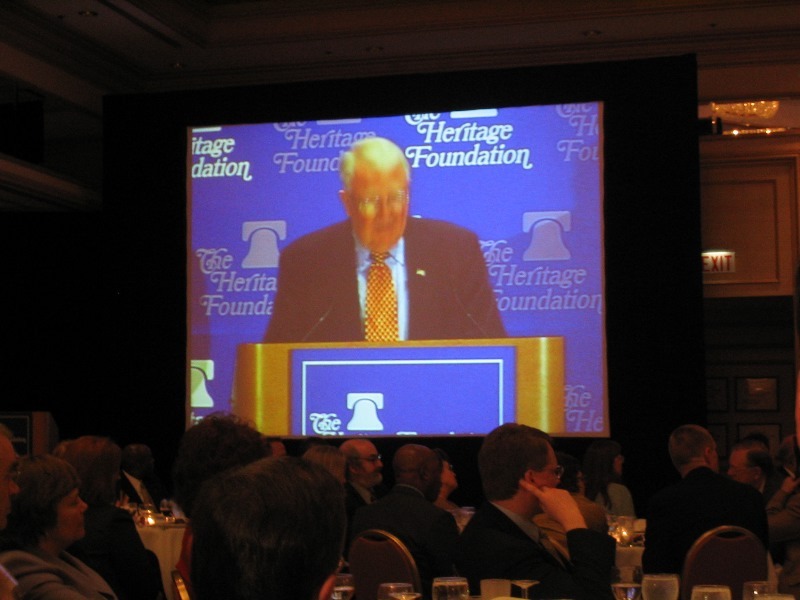 We (and the 650 other zealots) end the day with a delicious (free) dinner hosted by Ed Meese, Attorney General under Reagan, most famous for his role in the Iran-contra scandal. (Highlight of dinner conversation comes from Andy's neighbor, a young Russian turned strident American conservative: "I was there at the women's march in Washington. There were so many women, all of them single... lesbians... virgins.... DISGUSTING!" The topic of the evening is “School Choice”—providing private-school vouchers instead of public-school funding—and the speakers enthusiastically let us know that public education (they call it "government education") is one of things they intend to "bring to collapse" because of the way it churns out Marxists (sic). Finally, Meese presents the Salvatori Prize in American Citizenship to Virginia Walden-Ford, a woman who has managed to extract her son from DC's already gutted public education system via "School Choice," for which she is an ardent lobbyist. Now her son's in Iraq, with the Marines: standing ovation. We toast the whole thing with glass after glass of free wine and later, accompanying the Heartland Institute's lovely desserts, drinks. The alcohol makes us punchy. When a publisher from Sacramento described the beauty of "population control by market forces," we strain in vain to muster a suitable reply. We do better with the Cayman Islands booster guy: when he explains that the Cayman Islands is able to have such "enlightened" pro-business laws because it's basically just "a rock," we burst out: "How can we make this country a rock?!" Later he explains the importance of the Iraq war by asking rhetorically, "What if we hadn't gone into Grenada?" "What if?" we ask. "Then Grenada would have become a dependency of Cuba," he explains. "Right!" we exclaim. "And if we hadn't gone into Iraq, it would have become a dependency of the USSR." "Right!" the Cayman guy says, before (presumably) realizing the absurdity of the concept. Finally, as we're leaving the hotel, we go up to the Chilean who had explained his country's miraculous economy and gush "That was fantastic! We want to bring Pinochet to America!" Our government-educated brains are now in fine shape for thinking up what to do tomorrow. The next day, Friday, we arrive just in time for the closing luncheon and another installment of free food. This time we sit right up near the front, so that we can be close to the stage—and Ed Meese. A few minutes after the opening prayer and Pledge of Allegiance (in that order), as the salad is being replaced by the main course, we make our move. The sound of a wine glass being dinged by a spoon fills the banquet room (the microphone has been left on). The conversation of 650 zealots ceases as Andy, his face filling two screens on either side, announces a toast (video here). "To that very brave woman, Virginia Walden-Ford, who yesterday proved to us that through individual initiative and free markets, all of us can rescue our children from shoddy government education so they can learn what they need in order to compete in a free American marketplace. "But there is a nine-hundred pound gorilla in the room. Instead of fighting in the free American marketplace, this brave woman's son is fighting for what I think we all, or many of us here agree is a case of crony corporate welfare, a market distortion on a truly gigantic scale. "Ms. Walden-Ford's story convinced me that our political choices in the next election are simply not adequate. And I propose that on this historic anniversary of The Road to Serfdom, we take a giant step for Hayek's free markets by drafting a real free-markets candidate. And why not Ed Meese?" "To the next President and Commander-in-Chief of the United States of America, Ed Meese III!" Meese, sitting directly in front of the podium, screws up his face very strangely as he hears his nomination. Applause rings out for nearly ten seconds.